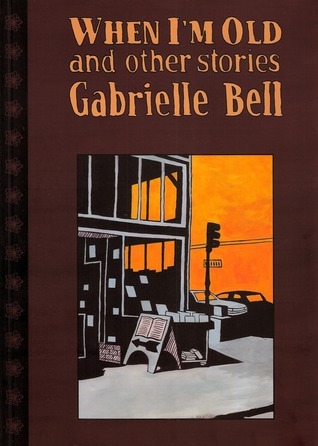 In a collection of short graphic stories called When I’m Old and Other Stories, Gabrielle Bell describes her life and the lives of others with a grungy art style paired with some pretty bizarre text and narratives. Bell explores the idea of imagining herself, as the title suggests, when she is old, as well as a relationship with a grandparent, the effects of alcohol, and more. Throughout When I’m Old and Other Stories, you’ll likely be reminded of a feel of the ‘90’s, though the collection was published in 2003. It features a grungy, sort-of grotesque atmosphere and style that I have always ascribed to what it was like to be a teenager and young adult in the ‘90s (though I only ever got as old as nine in that decade). Though I haven’t seen Daria, I was reminded of the show, albeit in a darker way than I understand Daria to be from what little exposure I’ve had, with each turn of the page. There’s something delightfully disgusting about When I’m Old and Other Stories, and it is perhaps Bell’s absolute rejection of traditional femininity in the work that makes it so. But this rejection of femininity often felt like a sort of internalized misogyny. The macho sort of attitude her characters carry, particularly combined with these elements of the obscene, the grotesque, the disgusting, makes When I’m Old and Other Stories feel like an outright accusation against feminine women, though there really is no outright statement I saw that actually gets at that point. This, again combined with a vague feeling that Bell is trying to prove herself or make some sort of point — again, something I couldn’t point out specifically in the work, just a general feeling — made the collection a challenge for me. There is, perhaps, a deeper meaning here that I’m not getting. There may be layers that better define a point that I simply wasn’t willing to work for. But when Bell’s art style is so unremarkable and the text chaotic and, frankly, often seemingly drug-influenced, I didn’t find that I particularly cared. If Bell was not going to put forth an amount of effort I felt appropriate, I was not going to make up the difference. Of course, When I’m Old and Other Stories was published by a micropress — and one named Alternative Comics. It has a zine feel to it, and I suspect that’s by design in some sense. So, perhaps it’s still my failing that I expected more. The book is a quick read if you, like I, don’t care to dive too much into it and assume Bell is speaking only on the surface here. It somehow feels significant, but it’s not especially entertaining — rather, it’s depressing in places, which is fine but not for me. I’ll reference more work I haven’t personally engaged with but felt tickling the back of my brain as I read this: Broad City and Girls and, perhaps even Portlandia (which I have seen a bit of). I wondered if When I’m Old and Other Stories represented a sort of prototype for these shows, which I imagine to be depictions of women as human. The difference is When I’m Old is far less commercialized, and perhaps, then, more true to its content. I read this book as part of Book Riot’s 2017 Read Harder Challenge, fulfilling challenge #21, “Read a book published by a micropress,” and I leave it behind with two hearts.